Add some levity to your life and make guests smile with funny doormats. 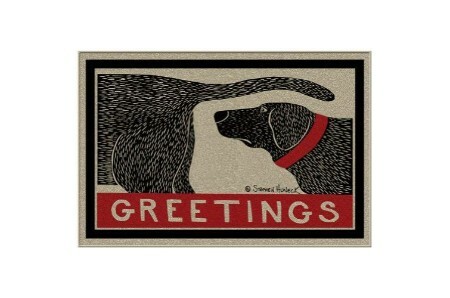 Funny welcome mats are the perfect way to inject personality into your home. Doormats serve a very practical purpose in our homes. Because of these unassuming rugs, a whole lot of dust and dirt gets stopped at the front door, instead of being tracked inside. Although they’re practical, doormats don’t have to be boring. Add some personality to your home and make your guests smile with funny doormats. Your welcome rug is one of the first things your guests see, even if it’s only to wipe their feet on! Our range of cool doormats is made from lightweight and durable material. They will last for years to come. Looking for a gift for a new homeowner? Cool doormats make a good choice because they’re fun and personal. If you want to keep a clean environment and add a touch of style and fun, you will certainly need a stylish doormat. There are many different types of doormat. They come in various sizes and styles depending on your budget and taste. Our funny welcome mats can be used inside and outside. Indoor doormats serve much the same purpose as outdoor doormats. Both ensure cleanliness, absorb moisture and prevent dirt and mess. Indoor doormats are perfect for stopping dirt and water being tracked from room to room. Check out our collection of the best doormats online and choose the best one that suits your home. Material - Funny welcome mats, for outdoor or indoor use, are available in all sorts of materials. These include flannel, fabrics, rubber, and coir which is a type of coconut fiber. Fabric doormats are great for use inside your bathroom and between your bathroom and other rooms. Coir doormats are known for their absorbent properties and are easily cleaned by rinsing with water and being left to dry. Size - There are different sizes of doormats ranging from small to extra large. Do measure the space that you’d like your new mat to cover so that you get the right size. Some mat sizes are standardized. For example, most front doormats are the same size, give or take a few inches. Color - You can find cool doormats in all sorts of colors and styles. Many also feature funky designs and patterns. Many homeowners go for a plain brown doormat because they don’t show the dirt that much. But if you are looking for unique doormats, don’t feel like brown is the only option. You can choose a color that fits your taste and style. Style - Depending on your taste, there are various styles of doormat you can use for your home. The styles vary depending on the texture, the color, the price, and the durability. Choose a doormat that will be attractive, functional, and welcoming. Styles available include retro, modern, and vintage. 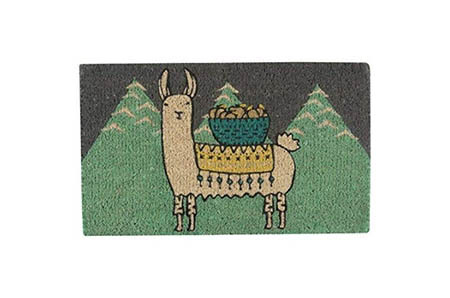 Hilarious green llama doormat, manufactured by: Danica Studio, model: 7001488cc. This top notch fashionable doormat, upgrades your style, amazing home décor stylish accessory. Awesome, check out this hilarious doormat, fun and affordable. Decorative black rubber doormat, a piece by ZBLX, model: ZBLXTL. Get it cheap, on sale, the best funny doormat, hilarious home decor layout accessory, size 23.6"x15.7". Finally, a funny doormat, a very unique décor piece. The highest quality tan flannel funny doormat, made by Wecye. A beautiful masterpiece. Made of excellent flannel, size 23.5x15.7". Cool decor item, unique and funny, and that's just the beginning! The stunning best selling fabric doormat, brand: ALLU, a superb home décor accessory. Material: prime fabric. This is the best price for an urban doormat, firm and solid. Make sure you welcome home a guest with a smile. Hilarious black silicone rubber doormat, made by BlueSpace. Made of top-notch rubber, a funny home decor upgrade piece, dimensions 23.6X35.4". If you want to add a touch of style you need this funny doormat, incredibly cool! This is hands down the coolest grey nylon indoor and outdoor doormat, made by California Home Goods, a must have unique doormat. Made with nylon and rubber, size: 17"x29.5". Super fun and for a reasonable price. The astonishing best seller doormat, manufactured by CKB Ltd, a must have home décor funny accessory. This item received the best reviews for hilarious doormat, such a nice design, get it now - on sale! Magnificent microfiber grey doormat, brand: Dog Gone Smart. Made with high quality microfibers, this is the best price for such a cool doormat, dimensions 32.x26. Get the most out of this funny doormat, it's the real deal. Fantastic stylish doormat, by: LianTuo, model: zhangzhizhong23-19070025. Best savings for such hilarious doormat, revives your style, a beautiful home decor accessory. This is one of the coolest modern doormat, enjoy! The smash hit natural coconut fibers funny doormat, a piece by Kempf, surprising home décor design piece. Made from coconut fibers, dimensions 16"x27". Customized funny doormat, affordable for everyone and so fun to have. Funny tan doormat, a piece by High Cotton, size: 27X18". On sale, the best exquisite doormat, a beautiful home decor funny accessory. 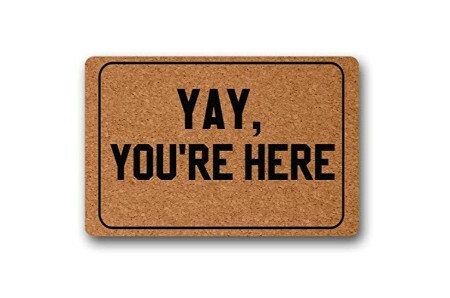 Get ready for the best hilarious doormat, will change the way you feel about home. Cheers! Nostalgia is back with this amazing doormat, brand: Emmilou Design Co, nostalgic design hilarious masterpiece. Size 18x30. Low cost urban doormat. There is no greater fun than greeting you guests in this fashion. Gigantic! It's hard to beat this awesome multicolored fabric doormat, made by: Toland Home Garden, nostalgic home décor enhancement piece. Made with prime fabric. Discounted modern doormat, the first step of a house redesign. Enjoy! Finally, a perfect green polyurethane grass doormat, a piece by ZestyNest, a heavenly design piece. Material: polyurethane, size: 24X48 . Get the best price with this bargain classic green grass doormat! Funny beige olefin doormat, by: SIGNALS, model: HN7451. Made with high quality olefin, get the best price with this bargain fine doormat, A beautiful home design masterpiece, dimensions 27.x18. Amazing and affordable unique piece! Hilarious beige coir doormat, by WHAT ON EARTH, model: CR-9539. This top notch enlivening doormat, astonishing home décor fashionable piece, size: 30.x18. The hilarious best seller urban doormat, a great masterpiece. Fancy multicolored fabric doormat, made by Libaoge. Material: excellent fabric. Buy it now, a top rated stylish doormat, amazing home decor layout accessory, size 18x30. Update your style with this modern doormat, incredibly fun and stylish! Funny modern doormat, manufactured by CKB Ltd, model: CKB-DOORMAT-BRINGCHAMPAGNE. 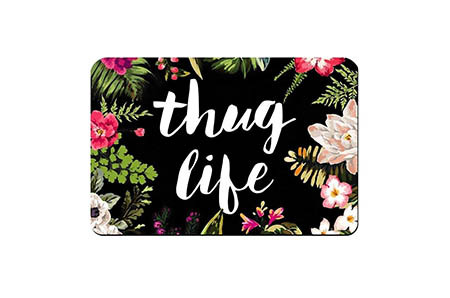 This is a bargain hilarious doormat, upgrades your style, amazing and fashionable piece. It's the real deal, funny doormat, a great masterpiece. Funny minimalist doormat, produced by CKB Ltd, model: CKB-TYPO-FOXSAKE. 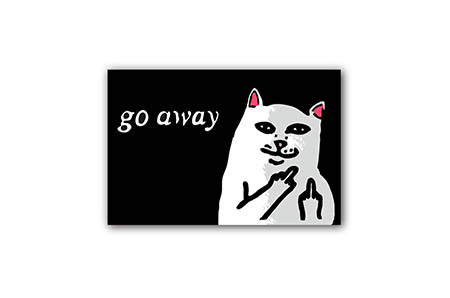 Least expensive cost for such a funny doormat, a must have décor masterpiece. If you love style and design you will need this funny doormat. Get ready for the best cassette tape rubber doormat, created by NINNAYUAN, an extraordinary brilliant masterpiece. Made of rubber, size: 18x30. The best urban doormat, amazing and affordable unique piece for every home! Experience an adventure with this cactus rubber doormat, by: MsMr, a beautiful home design piece. Material: excellent rubber, dimensions: 23.6"x15.7". Now on limited time discount, funny doormat, it's completely staggering. Imaginative multicolored olefin doormat, created by High Cotton, model: M505. Material: excellent olefin, discounted tasteful doormat, must have home décor elegant piece, size 18.x27. Classic doormat, will take your breath away! Nostalgia is back with this gangsta's paradise rubber doormat, produced by ZBLX, a delightful funny accessory. Dimensions 30"x18". This is a bargain hilarious doormat with such a a unique design. cheers! Funny tan coconut fibers doormat, made by CKB, model: CKB-WB. Made with natural coconut fibers, on sale, the best funny doormat, a delightful elegant piece, size 23.6x15.7. Discover the best urban doormat, exceptional. Choosing the best doormat can be a little bit tricky. Too big and the mat will not fit inside the space correctly, too small and the mat won’t perform its function very well and the mess will end up inside your home. Let’s take a look at how doormats are sized so that you can get the right size for your space. Before we go over the sizes of doormats, consider using this rule of thumb: The doormat should have a width that is equal to or greater than about 80% of the width of the front door. Therefore, if you have a standard exterior door that is three feet in width, the doormat best for you should be at least about 28.8” inches wide. But if you have a double door entry feature, you have an entry area which is a width of around 5-6 feet, which would mean that your doormat should be at around 4 feet wide. Be sure to measure the width of the entry door. Any doormat that is too narrow may not be able to provide enough surface area for visitors to easily step on it when entering or leaving the room. 18” x 30” The most common size for doormats. This size is ideal for single doors and smaller entrances. 24” x 36” Fits well when placed by doors that have decorative panels on the side and large single doors. This size also features select half round doormats. 24” x 48” This larger double doormat fits well with doors that have a patio. This is a double doormat size designed for smaller double doors. 23.5” x 59.5” This size is a double doormat size which is suitable for most double doors and large entrances. The Ultimate Mats range features sizes ranging from 18”x27 “inches to 6’x20’. Discover the best black polyester curtain set, manufactured by AmazonBasics, a heavenly sitting room masterpiece. Material: supreme polyester, size 52"x84". This item received the best reviews for classic curtain set. Exceptional! Embellishing chrome steel foldable drying rack, manufactured by AmazonBasics, model: FBA_SL-DRYM-005. Made of the highest quality of steel, a heavenly kitchen accessory. You need this in your life! A modern foldable drying rack, so cute. Gem dark gray cotton sheet set, created by AmazonBasics, model: JR-SS-DGRY-QN. Made of classic cotton, get it cheap, on sale, the best classy Sheet Set, a cool home décor fine accessory. A really unique urban sheet set, exceptional. Innovative laundry sorter, by AmazonBasics, model: LAU-006. Now on limited time discounts for this fine Laundry Sorter, a wonderful kitchen brilliant masterpiece. Finally, the best modern laundry sorter, amusing to utilize! Incredibly cool, this amazing black ceramic and fabric table lamp, by Rivet, amazing living room brilliant masterpiece. Material: fine ceramic and fabric, dimensions: 15". Top of the line classic table lamp, limited edition and look incredible! Embellishing black steel Floor lamp, made by Stone & Beam, model: HW-F1292BK. Made of first-class steel, discounted luxurious Floor lamp, a sublime home décor enhancement piece. The super best modern floor lamp, it’s an amazing décor item!